They may be without a manager or head coach as he is called these days, but Leeds United are still pressing ahead with their recruitment with the number of summer signings up to 15 now. Brazilian attacking midfielder Adryan and teenage defensive prospect Dario Del Fabro both completed loan deals from Cagliari over the weekend and were joined by winger Brian Montenegro, also on loan from Nacional Asunción, on Monday to be the latest to join the Cellino revolution at Leeds with the aim seemingly to build two teams not one. When the emergency loan market opens up expect Leeds to be in the market again, probably for another striker following the departure of Matt Smith and Dominic Poleon and with Souleymane Doukara still sidelined through injury. It was little wonder perhaps that David Hockaday could not identify his first team and had trouble getting results with so many new boys having to be given time to settle to English football. That same problem lies ahead for whoever accepts the task of following the sacked Hockaday into the hot seat at Elland Road. A number of candidates have been linked with the vacant Leeds job with original favourites to take over being former West Brom manager and Chelsea coach Steve Clarke, experienced Italian coach Rolando Maran, ex-Brighton boss Oscar Garcia – who has now gone to Watford - and Leeds favourite Gary McAllister. Attention turned big style to former United boss Simon Grayson when he was backed down from 50/1 to 6/4 by bookies on Sunday while the sudden departure of Italian Giuseppe Sannino from Watford – following apparent unrest within the playing squad at the manager’s methods – has raised eyebrows and had him immediately linked with a move to West Yorkshire. Another possible candidate to emerge is Swindon Town’s Mark Cooper – son of former United great Terry, who admits to being flattered by the link although he says he has a job to finish where he is. 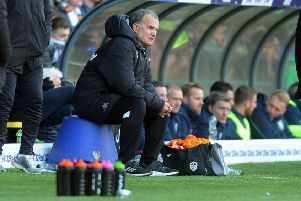 Neil Redfearn, meanwhile, did his chances of either getting the head coach job one day or indeed now no harm as he oversaw a hard fought 1-0 win for the Whites as caretaker boss for last Saturday’s game against Bolton Wanderers. The win was largely down to a string of fine saves by goalkeeper Marco Silvestri, but there was more energy about the team’s display in the first half and Redfearn could take credit for including more youngsters in his line-up with Alex Mowatt and particularly Lewis Cook impressing in midfield. Redfearn believes there is a bright future at the club with the talented youngsters coming through the academy system. He said: “Whoever is appointed manager will not have a great deal to do. “There is a well-balanced, happy, ambitious and very talented squad here and this club has Premier League facilities and support. Redfearn reserved special praise for 17-year-old Cook after his assured league debut. He added: “I thought Lewis Cook was the best player on the pitch by a mile. “To be honest it wasn’t a difficult decision (to play him). He’s a top player and he’s going to be an outstanding young player.